Moses P. Cobb (1856-1926) was the eldest son of slaves Ely and Holland Cobb. He was born in Kinston, less than a decade before the end of the Civil War. Times were not easy for the African-American community after the Civil War, so at a point during Reconstruction, Moses wanted a better life. He had heard stories of New York and one day Moses started his long journey on foot to that city of his dreams. There were hardships along the way, but to be able to fulfill his dreams was worth it. He met and married a North Carolina girl named Temperance; they lived in Brooklyn's Weeksville community, which had been founded years earlier by free blacks and freed slaves. Moses got a job as janitor at a local police precinct station, where he was hard-working and earned the respect of others. After encouragement from his superiors, he took the police exam and passed. In 1892, he joined the Brooklyn Police Department, six years before the BPD consolidated with the New York Police Department. Upon joining the force, Cobb guarded prisoners and helped to transport them when needed. In those times, it was believed a black officer should not be seen patrolling the streets. It was not until 10 years later he was made a patrolman and worked the streets. By 1917, he was ready for retirement, making him the first African-American in the NYPD to be a career police officer and retire with a pension. His retirement brought the recognition of 25 years of service where he was a highly decorated police officer and a trailblazer for racial equality. Moses led the way and today, more than 5,000 African-Americans serve in the NYPD. When he retired, his wife had died and Moses married Sophia Battle, a Kinston woman more than 30 years his junior. They moved back to Kinston where Moses Cobb lived out the rest of his days. He could often be seen wearing around town his old NYPD uniform without the badge. It is said he was a proud man of quiet demeanor and respectful to everyone. His manner earned the respect of his fellow Kinstonians of every race. Moses passed from this life in 1926 and is buried in Kinston's Cedar Grove Cemetery. Moses P. Cobb, who once walked the streets of Kinston, was featured in a one-hour documentary produced by Northern Light Productions in Boston; it aired on the History Channel on Feb. 13, 2002 and was hosted by Dr. James O. Horton. The documentary title was “A Fragile Freedom African American Historic Sites." 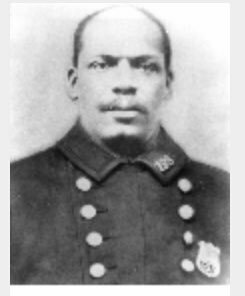 On Oct. 29, 2011, in Brooklyn where Cobb had patrolled, a street that includes the NYPD's 77th Precinct was named for Patrolman Moses P. Cobb. Members of his family were present during a ceremony that honored Cobb’s service.